Pop/rock foursome Hot Chelle Rae will bring their upbeat sound, which has spawned national radioplay, to the Filene Center. The band formed in 2005 in Nashville and is composed of brothers Ryan Follesé (lead vocals and guitar) and Jamie Follesé (drums), along with Nash Overstreet (lead guitar) and Ian Keaggy (bass guitar), who all come from musical families. They released their first album, Lovesick Electric, in 2009, but it was 2011’s Whatever that brought them great success. The album features pop favorites “Tonight Tonight” and “I Like it Like That.” Early in 2013 Hot Chelle Rae released the single “Hung Up” and is scheduled to release an album later this year. The winner of four Grammys, alt-country musician Lyle Lovett brings his genre-bending music to the Filene Center. Lovett’s music features a mix of country, blues, gospel, and swing with a touch of unique storytelling and humor. His many hits include “If I Had a Boat,” “She’s No Lady,” and “Private Conversation.” A native of Texas, he began writing and performing songs, while still a student at Texas A&M. In 1986 Lovett released his self-titled, debut album to critical acclaim. Since then he has released a live album and 10 other studio albums, including 2012’s Release Me. When not making music, Lovett can be found acting in films such as Fear and Loathing in Las Vegas (1998) and Walk Hard: The Dewey Cox Story (2007). Making its Filene Center Debut, STS9 (Sound Tribe Sector 9), will play its innovative electronic/pop/rock music that jam band aficionados all over the country have come to love. The instrumental rock band released its debut album, Interplanetary Escape Vehicle, in 1999 and established itself in the jam band scene. Since then, STS9 has played at some of the biggest music festivals in the world, including Bonnaroo, Coachella, and Lollapalooza. Most recently, the band released When the Dust Settles (2011). The EP peaked at No.1 on the iTunes Electronic chart. Pop/rock band Umphrey’s McGee, known for its jam band style and psychedelic light shows, brings its rocking originals and creative covers of anything from Toto to Metallica, to the Filene Center. Formed in 1997 at the University of Notre Dame, Umphrey’s McGee released its first album, Local Band Does O.K., in 2002. In 2006 the band began making recordings of every show. A year later they released 2007’s The Bottom Half, which reached No. 7 on the Billboard Heatseekers chart. Mantis (2009) also had considerable commercial success, even charting on the Billboard 200. Most recently, the band released Death by Stereo (2011) and continues to make every show an interactive experience for fans. Electronic duo Up Until Now will perform its cross-genre music on the Filene Center stage. Founded by Jay Murphy who has a background in melding reggae, world music, rock, hip-hop, and more since the early 2000s, Up Until Now also features drummer Kyle Holly. Since its inception, the band has released three albums, including 2012’s The Pleasure Sessions EP. Up Until Now has performed with many other artists, including Jon Barber of the Disco Biscuits, and has opened for performers such as Snoop Dogg, Bonobo, and Emancipator. 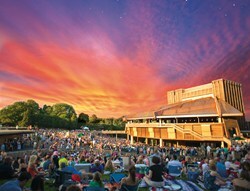 Tickets can be purchased by calling 1.877.WOLFTRAP or online at wolftrap.org. For more information, call Wolf Trap at 703.255.1868.